We've made it easy to buy your In Ground goal. 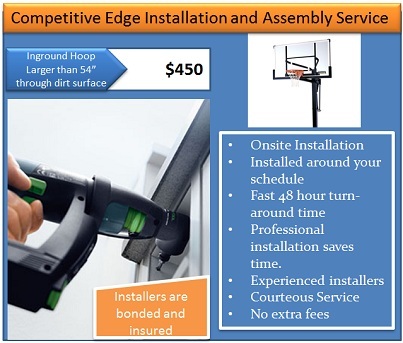 Let us make your life easier by installing your hoop onsite at your home. Here's how it works. Our authorized bonded & insured contractor contacts you to set up an assembly appointment. They'll ask you some questions and install your product onsite at your convenience. Removal and disposal of old equipment available at an additional cost - contact us for a special quote. We service 95% of the United States and many parts in Canada. If you live in an exceptionally rural location and are concerned we don't service your area please contact us and provide your zip code before purchasing the product and service. Please note that products requiring digging and concrete installation schedule around good weather and it can take weeks before the ground is warm enough to safely and professionally complete the In Ground installation.